Good Morning! This is my card for this week's challenge at Joan's Gardens.....love her challenges. 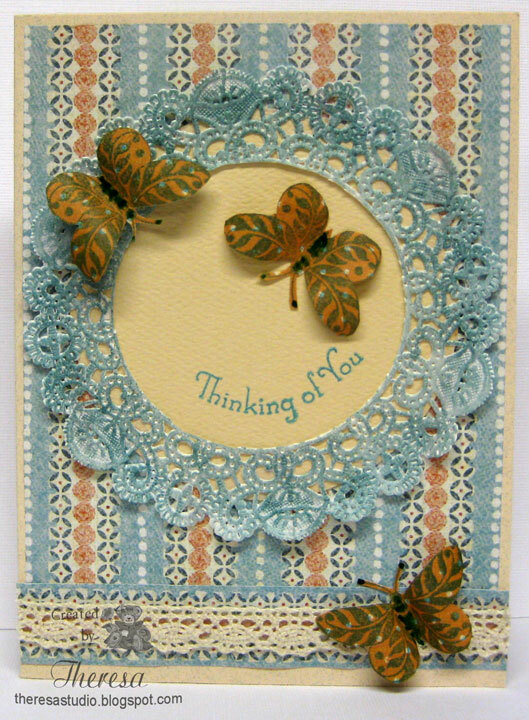 My DH says I took artistic license with this card as he says there are no butterflies this color, but he really liked this card even tho it has frills and lace. The challenge was to use the colors peach and blue (teal), use some butterflies, and add something frillie. I found this patterned paper in my stash and it gave me the start for peach and teal. I colored a paper doily with Copics and cut out the center and layered over a circle of light peach CS from scraps. I stamped the sentiment...I was able to curve it because it was a flexible clear stamp. 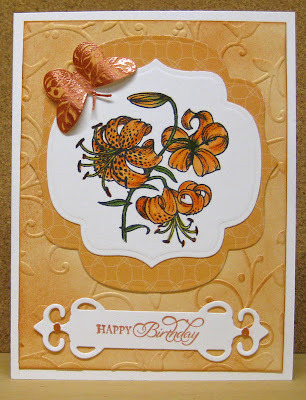 I stamped the butterflies on a scrap of peach patterned paper and cut out and shaped. Assembled the card on a base of light peach CS, mat of the pattern paper, the doily, added a border of lace atop a strip of the pattern, and finally arranged the butterflies. Papers all from stash and scraps. Patterns are K&CO? Layers of Colors - "Flutterescent"
Sometimes it is fun to take artistic license! I think this card shouts Easter and Spring! 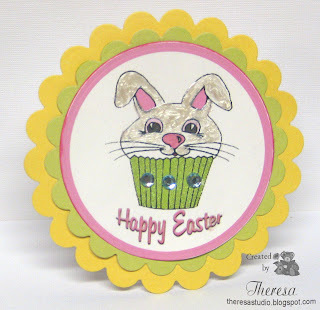 I used another stamp from my win at Flourishes...these little bunnies are so cute and so fun to color. Followed Silke's sketch from Crazy 4 Challenges flipping the sketch and adding ribbon for the stripes. Paper Pretties: Use spring as Inspiration. Wags N Whiskers: Do a spring creation. The Creative Cottage: Spring has sprung. 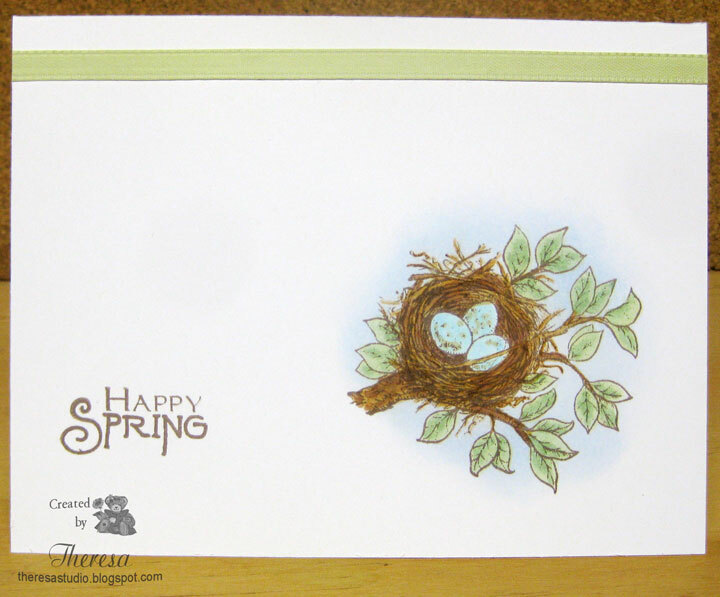 Supplies: Flourishes "Spring Has Sprung"
I have missed doing the one-Layer Challenges at Susan's Simplicity blog﻿ but I just had to make time for this challenge: to use an egg or eggs on your one-layer card. I won the perfect stamp for this card from Flourishes for their speed challenge and it was in the mail last week( how quick was that). I just had to put it to use. The set is "Spring Has Sprung". Colored with Copics and sponged with blue. Stamped the sentiment from Mark's Finest Papers and finished with ribbon border. 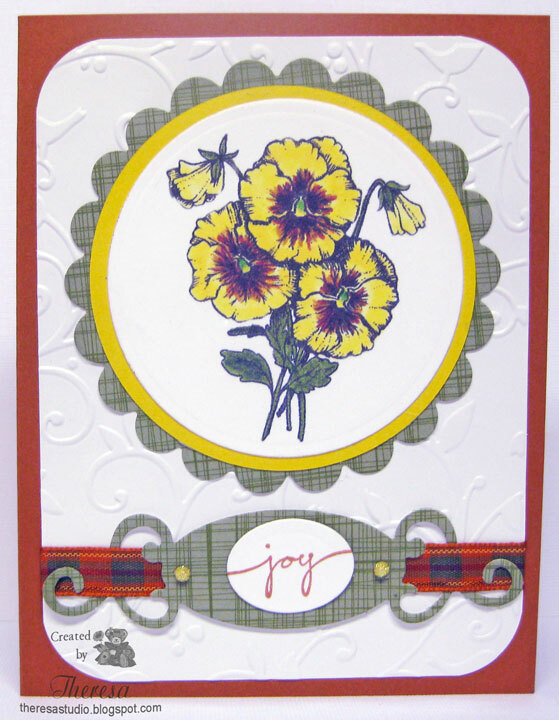 Stamps: Flourishes "Spring Has Sprung", MFP's Happy Pansies"
Copics: B000,01, G20,21, E55, 25. I also received the other 3 new releases from Flourishes as part of my prize and look forward to creating with them all. Have been missing in action the last few days....not feeling so well...must be a bug. My DH is serving me hot tea and lemon as I write this. He's the best! Seems like it is taking forever to write this. I stamped the daylily with Memento Rich Cocoa and colored with Copics. I cut the image with Spellbinders Labels 9 and placed on a mat cut a with larger die. Placed this on a mat embossed and sponged with color. 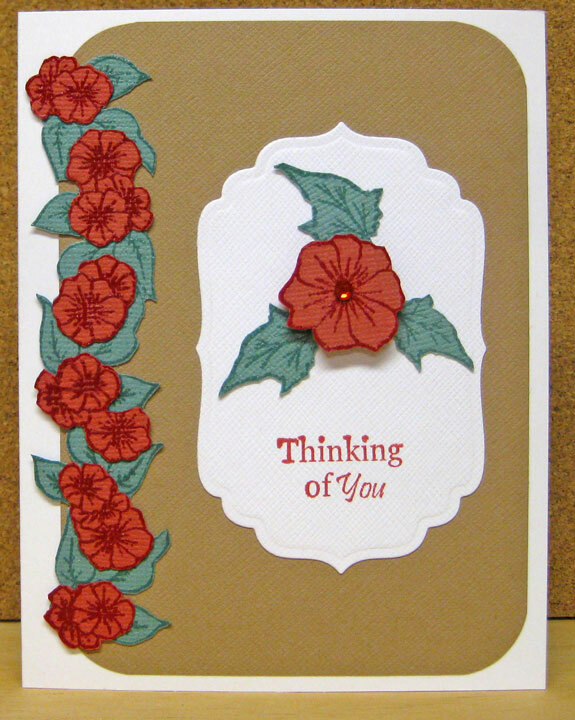 Stamped sentiment on white CS and cut with Spellbinders fancy tags. Stamped butterfly with versamark and heat embossed with clear EP, cut out and added with pop up dots. Used White CS for base. For Fun Challenge: Make something with flowers and a senti as a focal point. Lil Red Wagon: Use butterflies in your project. Stamps: Flourishes "Calendar Set 3", GKD "Fanciful Tags" by Nina, Layers of Color "Flutterescent"
Another circle card for some challenges. Printed image on White CS and colored the digi using Photoshop. 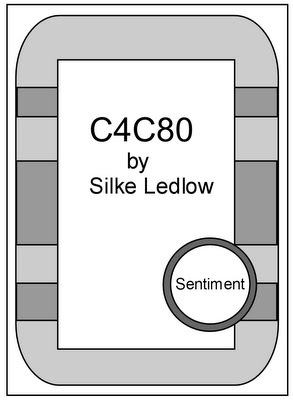 Added computer generated sentiment. Cut with circle die and added yellow and green mats cut with Scalloped Circle dies. Attached this to base of white CS folded and cut with circle die. Added Stickles to bunny and blue rhinestones to cupcake. Kaboodle Doodles: Color challenge use yellow, blue, pink, and green. Used rhinestones in blue. 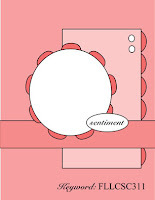 Make round card with 3 pastel colors, 3 bling, and 1 image. 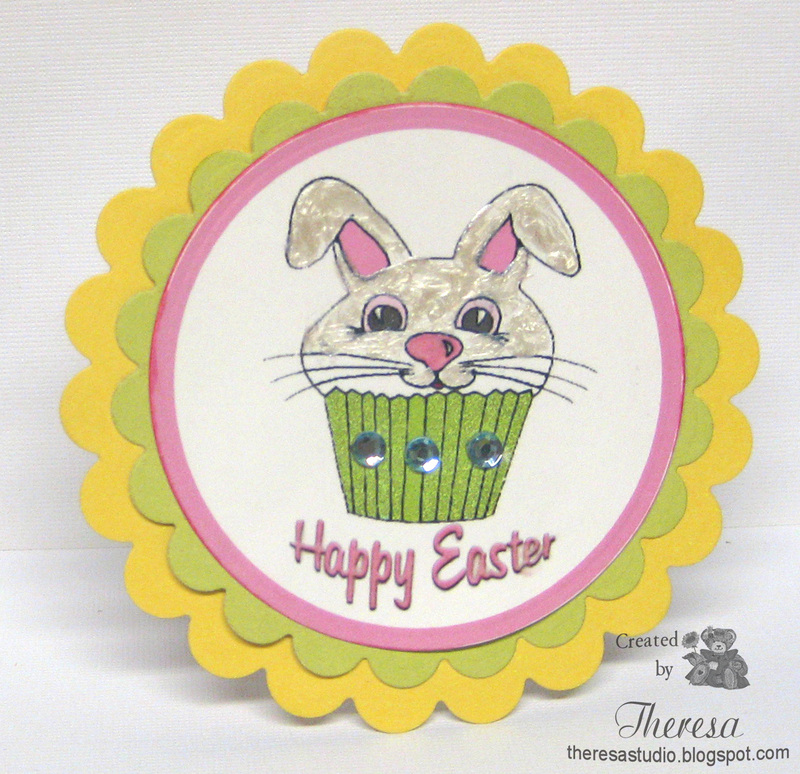 At Speedy the Cat, Karen is challenging us to use a round card with 3 pastel colors, 3 bling and 1 image. 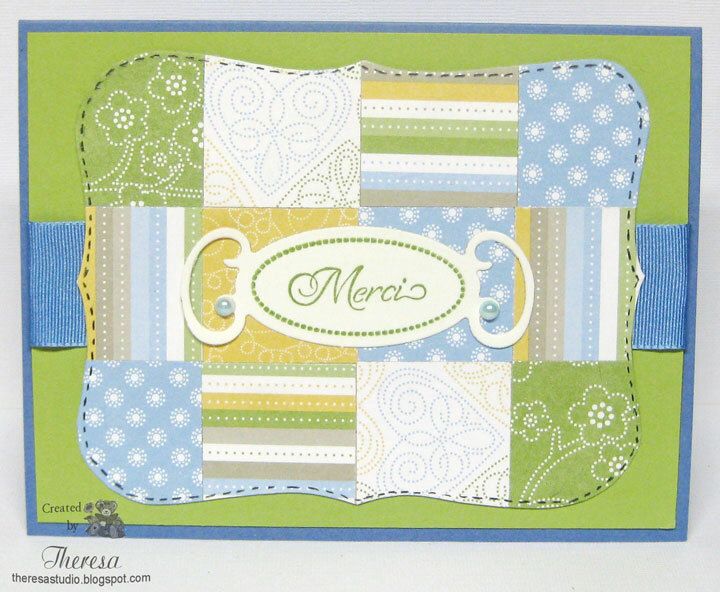 Used a blue scalloped circle and topped with yellow circle and green circle that I embossed. 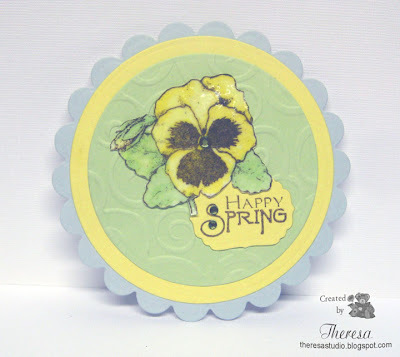 Stamped Happy Pansies on white cs and colored with Copics. Covered with versamark and heat embossed with Clear EP to give some depth and shine. Cut out image and attached to card. 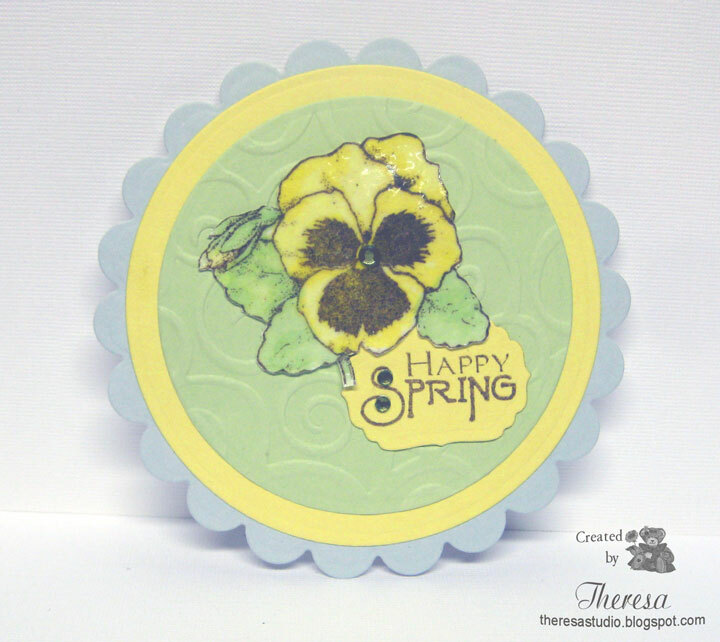 Stamped sentiment and cut with die and added bling to the "S" and center of pansy. 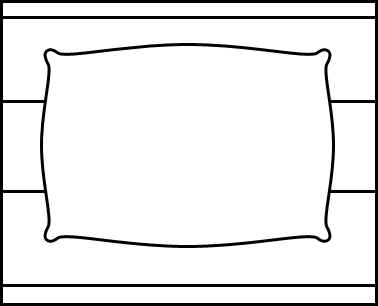 Attached all to a folded Circle CS for a base which does not show. Thanks to Karen for a fun challenge. Creative Cottage: Spring has sprung. Critter Sketch has a challenge to make a card using the photo on the right for inspiration. 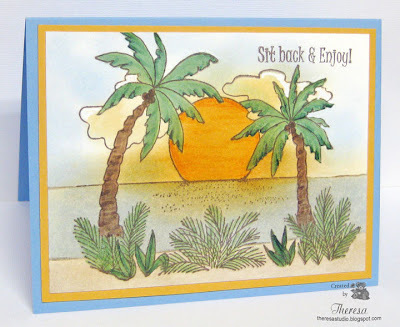 I remembered this "Just for Fun" stamp that I won last year and thought it would be perfect for this challenge.....I cannot be more inspired that to stamp a beach scene at sunset after 6 weeks on an island. I kind of experimented with this card using sponging and masking to get the look I wanted. After stamping the image on white, I colored the trees and plants with Copics. I sponged colors on the sky, beach and ocean masking areas as I went. I then masked everything but the sun and sponged and colored until I got the effect shown. I sponged more color in the sky and clouds after I uncovered the sun. Thought the clouds and sky should reflect colors of the sunset. Trimmed the image and matted it on orange and attached to blue card base. Stamped sentiment from MFP's. Timeless Tuesday Flourishes: Use masking....usually use Flourishes stamp for their challenges but this was fun to do masking. 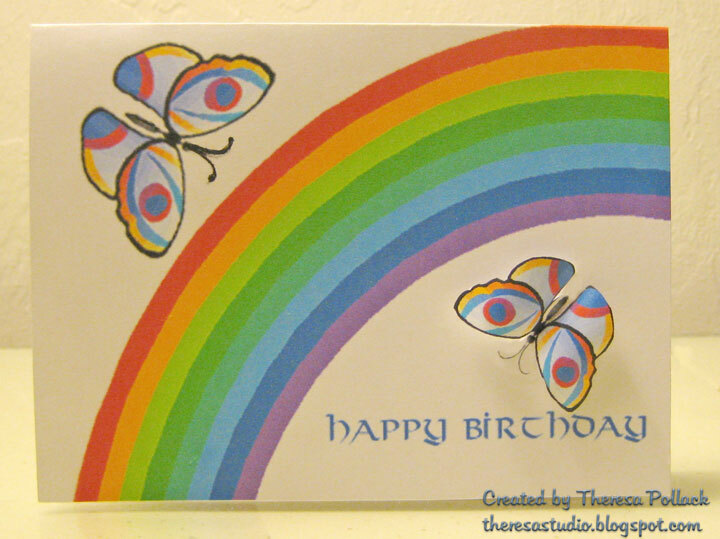 Paper Cutz: Make a card using any color or theme. 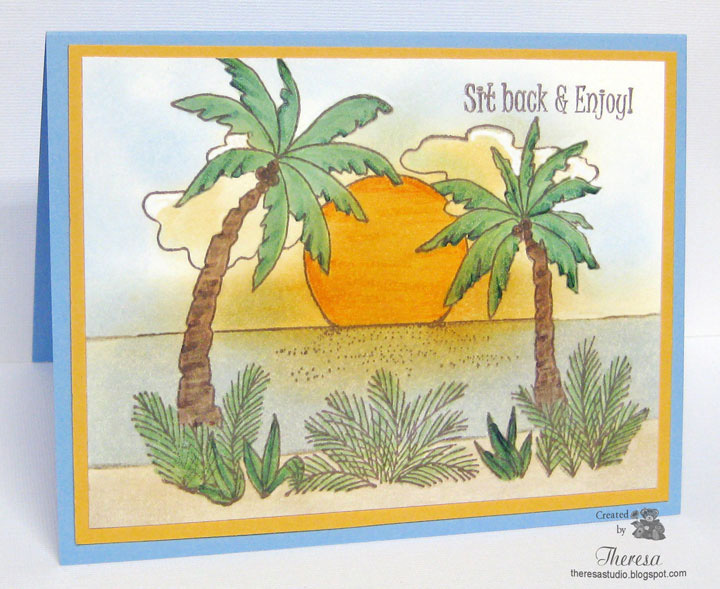 Stamps: Just For Fun "Sunset with Palms", Mark's Finest Papers "Let the Sunshine In"
What a fun time to be at the beach! I love the challenges at Joan's Gardens. 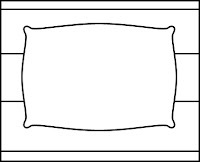 This week Joan wants us to use the colors pink and green, create a thank you card, use some kind of stripes and something scalloped. My card just evolved as I use the required elements. 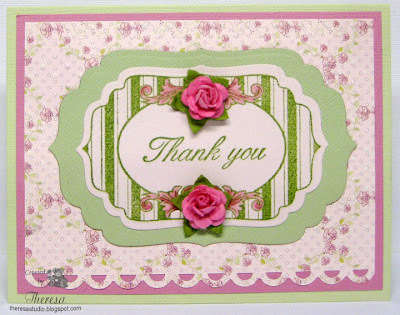 I started by stamping a striped frame design on light pink card stock with green ink and cut out with Labels 4 die. I colored in some of the design with pink Copics. I stamped a Thank You verse on the center. I matted this on green CS that I cut with a larger Labels 4 die. 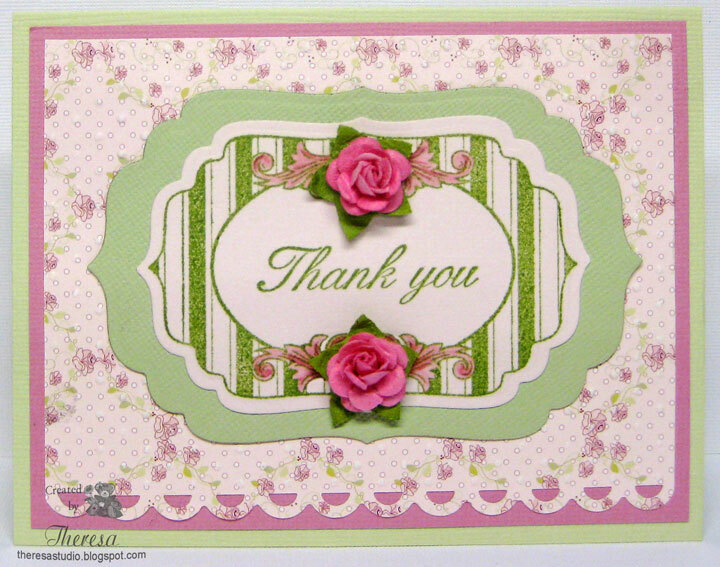 I used another shade of green for the card base which I layered with a deep pink CS and Rose Pattern Paper ( found in some digi paper that I had printed) that I embossed and punched with a scalloped design on the bottom edge. Added some pink roses for dimension. And that's how I made my card. Craft Your Passion: Show your appreciation. Let's Ink It Up: Use die cuts and punches. Sentimental Sunday: The sentiment should be the main focus. 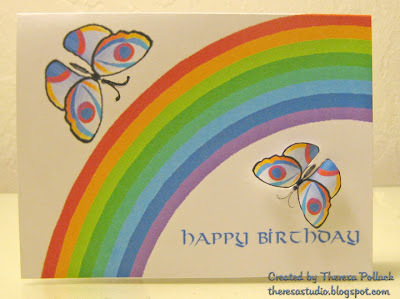 Creatalicious Challenge: Make card with two tones/colors. Used greens and pinks including DP. Papers: Bazzill Solid Textured CS of Greens and Pinks, Inger Harding Design Digital Paper "Sweet Roses"
Stamps: From GKD Sets - "Inside and Out" and "Lovely Labels"
Card with Some Heavy Metal! 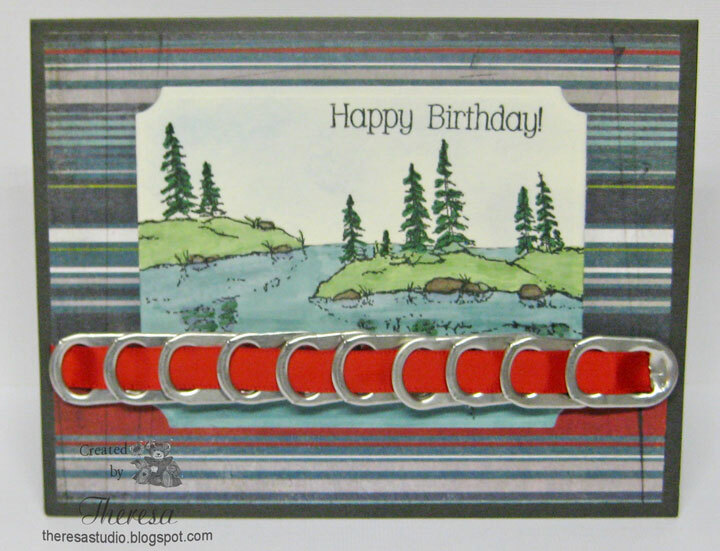 There were several elements that I wanted to use in this card: Metal, Recycled item, Gina K stamp, Basic Grey paper, Ribbon, Happy Birthday sentiment, and something for a man. I think that I have included them all. 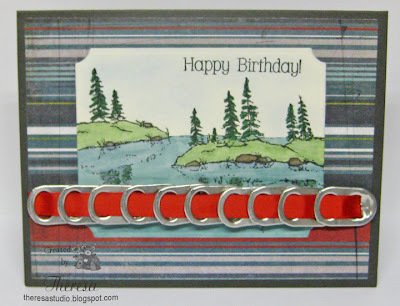 I used GKD stamp from " Life is Good" by Theresa Momber for a manly card, Basic Grey Oliver paper, tabs from soda cans for the metal and recycled item, and red ribbon. I stamped the image with Memento Tuxedo Black ink on GKD Ivory CS and colored with Copics G21,28,Bv 25, 72, E49, C1 trying to pick up colors in the striped paper and cut with a Nesties die. Sponged the sky with Memento Summer Sky ink. Stamped a sentiment from Mark's Finest Papers "African Veldt" set using black ink.Used GKD Smokey Slate as the card base and a mat of stripe DP from Basic Grey Oliver. I threaded the soda can tabs on red ribbon and attached with scor-tape. Stamp TV: Colleen's challenge Make mine metal. Basic Grey: Use something recycled. Used soda can tabs. Our Creative Corner: Use something that you did not throw away. Used soda can tabs. Kaboodle Doodles Challenge: Make a Birthday Card. Simon Says Stamp Challenge: Say Happy Birthday. Really Reasonable Ribbon Challenge: Make one for the boys with ribbon. Let's Ink It Up: Use die cuts and punches. Used Nesties die cut for image. At There's Magic in the Air this week, Katrina challenged us to use our favorite color and make a monochromatic card. This is not really my fave color but it is what I used....(forgot about the favorite part and I had already made the card using this color). Guess I could have just pretended it is my fave. I used Paper Cupcakes digi Deco Flowers in Vase 2. Colored with Copics V12,15,17,95 and cut with Nesties Label 4. Added some Memento Sweet Plum around the image to soften the white CS. Added some glitter to the center of the flowers with Jelli-ink Pens and Sakura Clear Star pen. 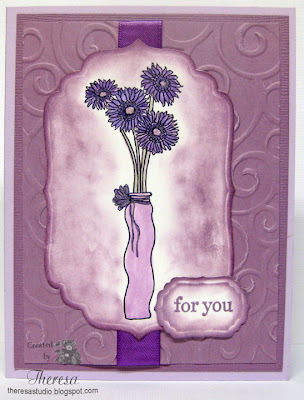 Used card base of Bazzill Purple CS and a mat of Momenta Purple Paper that I embossed with Cuttlebug Divine Swirls. 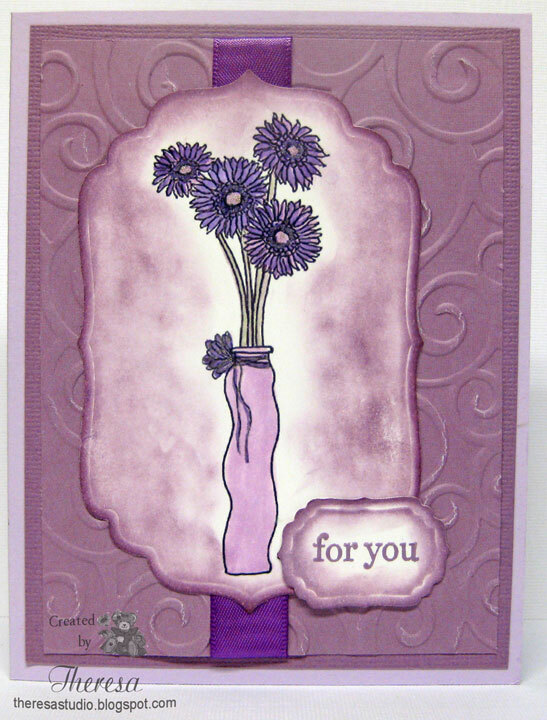 Stamped the sentiment from GKD "A Year of Flowers" with Sweet Plum ink and cut with smaller Labels 4 die. Added Purple ribbon from Michaels. I am entering this card in Card Positioning Systems Sketch Challenge 209. I received the papers ( unknown but think they are SU) in a stamp kit from my Card Club and adapted them to the sketch shown on the right. Added some blue ribbon from my stash. I custom cut the design of the "Quilt" somewhat free hand but using Spellbinders Label 1 as a guide. Stamped sentiment from GKD Lovely Labels and Fanciful Tags with Memento ink and cut with Spellbinders Fancy Tags die. Added pearls colored with Copics to finish. Making this short and quick. Have to hurry and get in before deadline. Deb at Stamp TV had an unusual challenge on STV's March release party: Give up your favorite product to make a project for this challenge. Set aside your typical go-to, and reach for something different. My favorite products that I gave up for making this card are Copics and Embossing Folders. Instead I stamped images using versamark and clear embossing powder on solid card stock. I then cut out the stamped images and arranged ...not a fan of cutting with scissors...I prefer die cutting. I am doing a second post today....making up for lost time, I guess. Good to be working in my studio today. This is another challenge that Flourishes is using to usher in their March Release in which you could win the entire March Release! To play, all you need to do is create and use a cut edge on your card. That means to use a die cut, a border punch, a corner punch or any type of decorative border! For my card I have used a corner punch, Nesties circle and oval dies, Nesties scallop circle die, and Spellbinders Ribbon Tag die. Think that is enough cutting to be in the running? I used Flourishes Pansies Stamp from Calendar Set 1...have all 3 of the Calendar sets and I love them. Sentiment is from an old SU stamp. Papers are from stash including glossy white, GKD Pumpkin Spice and white, and a pattern from scraps. Used Cuttlebug EF. Added a scrap of ribbon and some glitter domes. Wild Orchids: Dieing to punch it out. Charisma Cardz Challenges: To die for. Last night, just before going to bed, I came across a speed sketch challenge from Flourishes that is part of their March release with a chance to win the entire new release with just one challenge. WOW!! But the card must be entered by 10 AM Central Standard Time ThisMORNING. It’s Flourishes first ever SPEED CHALLENGE and my first speed challenge to enter! So as soon as I got up and grabbed a cup of coffee, I headed to my studio to create this card using the sketch shown below. 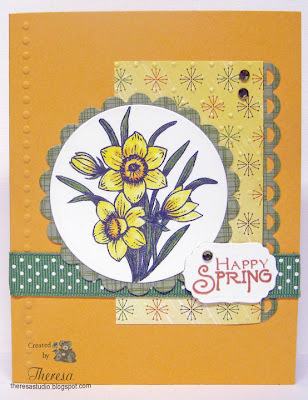 I stamped the daffodils from Flourishes Calendar Set 1, colored with Copics, cut with Nesties Circle die and matted on a scalloped circle of green. Using a card base of SU Marigold Morning, I did some embossing, added a rectangle of print edged with scallop border using a punch, added ribbon, 3 rhinestones, and a sentiment from Mark's Finest Papers stamped in Memento ink. Attached the daffodils image. 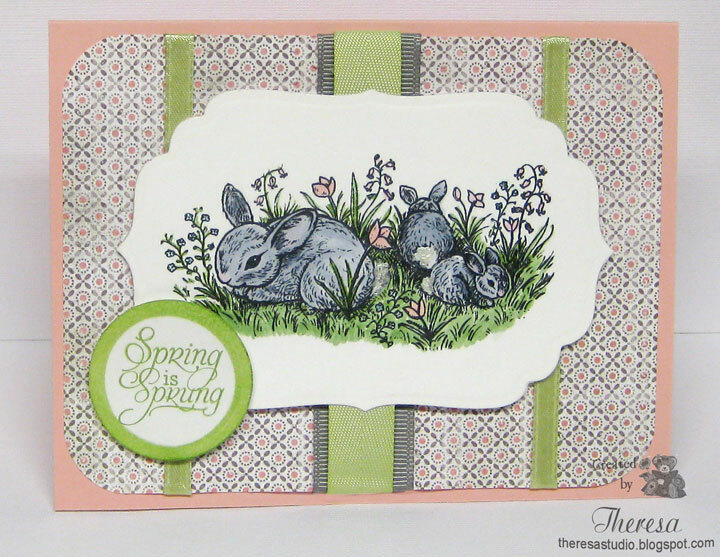 Beary Scrap: Theme is spring. Maybe I'll get lucky today ..... maybe the luck of St. Pat's Day will carry over to Friday....love Flourishes stamp and the new release is great. I have been so busy unpacking and getting back to my normal life after Florida that I have not yet got back into the groove of making cards and blogging, but am working my way back to my studio soon. I threw together the card above using Print Shop just to wish everyone Irish or not (isn't everyone a bit of Irish today?) 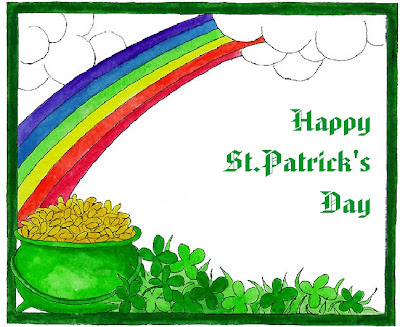 a Happy St. Padddy's Day! 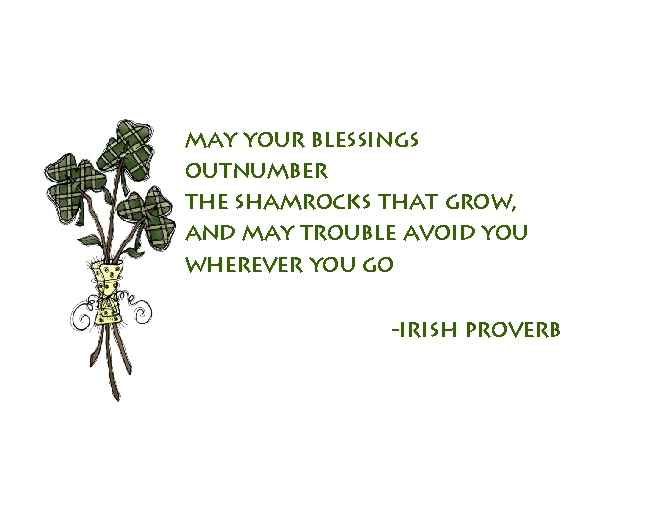 May your day be filled with many Irish blessings! Thanks for dropping in for a wee moment, my lassies and laddies! Hello and welcome. Has been a few days since I posted but not making many cards. I do have this one that I made using Print Shop and printed on cardstock. The butterfly on the right was printed and cut and attached with pop up dots to give some dimension. 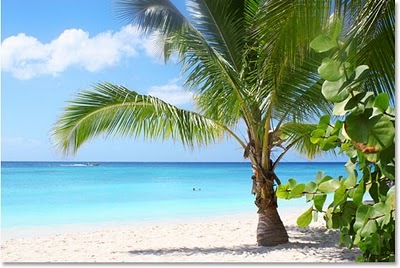 It is a very rainy morning here on the island in Florida so I am not out on the beach or birding. It is really pouring...one of those heavy tropical rains. Wonder if a rainbow will follow. At least, there's one on my card. Made this one just for the fun ...no challenges for a change. Will be back to more regular card making and posting next week. Driving home this weekend. We are having rain today so I am playing inside. I made this card using a digi from Paper Cakes "Wildflowers Bouquet". I printed and colored the image with copics and cut out with Spellbinders Label 4 and placed on a yellow mat. 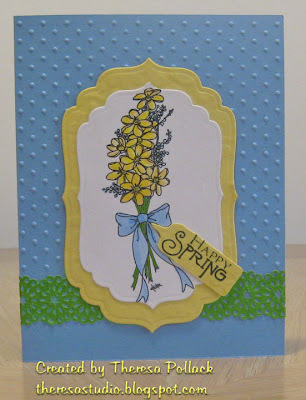 I used a card base of blue CS that I partially embossed with Cuttlebug EF Swiss Dots. Added some Adhesive paper lace and added the image and attached sentiment from Mark's Finest Papers stamped with Memento Tuxedo black. Cupcake Craft Challenges: Anything but square. Fab n' Funky: Theme is Spring into Action. 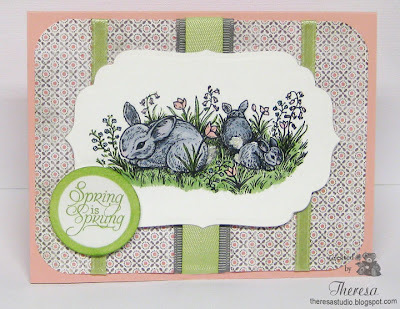 Cute Card Thursday: Do a spring inspired card.